Three seconds. That is the amount of time it takes for people you meet to draw their conclusions about you. After the initial meeting their experiences with you are often filtered through the prism of what they thought about you when you first met. If someone’s first impression of you is “What a jerk!” everything you do afterward will tend to reinforce that intial impression that you are a jerk, even if you’re not doing anything to be a jerk. So you need to win your customer over quickly! One of the quickest ways to make a great first impression in business, is to dress the part of a sucessful businessperson. I'm a firm believer that you should generally wear a suit onsite. Nothing makes you look more professional than a suit! To begin with you’d ideally like to have at least two suits to begin with. Start with a grey and a navy blue suit, which will give you lots of versatility when you choose to "mix and match." Fabric: Look for suits made of 100% wool or a wool-blend. Wool has a timeless apperance and wears well over time. As you build your wardrobe you can add items that are made of other materials (I have a tan suit from Banana Republic that is made from cotton that I love!) but start with wool. I would also avoid rayon, gabardine, and 100% polyester suits. They won’t wear as well, last as long or look as good as something made of wool. Button Style: It’s hard to go wrong with a classic single breated 2-button suit. The look is timeless and will weather changes in fashion and taste. Also, the last button on your coat should always be left unbuttoned! Pant Style: Flat front or pleated? If you want a sleeker more streamlined look, I'd opt for flat front pants. If you need more room or would like more comfort, then pleated may be the way to go. Fit: A lesser quality suit that is properly tailored to your body will look better than an expensive suit that doesn’t fit as well. If you’re used to wearing clothes looser, having a more streamlined suit may feel weird-but you’ll notice a huge difference. Obviously, the picture below is a little exaggerated, but you get the idea! Fit (continued): Once you’ve purchased your suit, bring it to a tailor if you have to and make sure that it makes you look good! Also, when your arms are at your side, you should be able to see about an inch of your shirt’s cuffs peeking out. If it doesn’t your coat sleeves may be too long or your dress shirt sleeves too short. Sizing: Suit coats have two measurements-chest size and length. A tag marked 42R has a chest size of 42 inches and is a “regular” length-which generally applies to men 5’8” and taller. Other length measurements are “S” for short and “T” for tall. Have an associate at a store properly measure you before trying on suits. Plan on having at least five dress shirts. If your company dress code allows, incorporate colors in addition to the standard white and blue. And, just as with suits, your dress shirt should have a more streamlined fit that doesn’t have a bunch of excess fabric all around. Sizing: Dress shirts usually have two sizes as well-neck size and sleeve length. A shirt with a 16-34 size means it has a 16 inch neck and a 34 inch sleeve. Have someone measure your neck and sleeves so that you get the perfect fit. Fabric: Both cotton and synthetic dress shirts can look great, so go with whichever you feel most comfortable with. Either way, make sure that you take care of them with proper laundering and keeping them pressed (or ironed.) Sometimes when I got really lazy I would just iron the collar, cuffs and the front of the shirt and then NEVER take off my coat during the day! Ties: I think ties are a great way to add color, style and individuality to your wardrobe. If you're starting out avoid whimsical ties like Tabasco ties or ones featuring your favorite football team's logo and start with basic, professional and modern looks. Shoes: If possible, you should have at least two dress shoes. Shoes need time to dry out and recover after being worn all day, so if you can alternate between shoes that will help them last longer. I would have one black and then either a pair of burgundy or dark brown shoes. Lace up shoes are considered dressier than slip ons; if I had to pick between the two, I’d pick the lace up. Black shoes can be worn with almost any suit while brown and burgundy shoes should be paired with navy, grey and tan suits. Don’t wear your brown or burgundy shoes with a black suit! Socks: I’ll keep this simple! Do not wear white athletic socks for work ... ever! Your socks should match your pants not your shoes. If you have tan pants on and dark brown shoes, you should wear tan socks, not dark brown or black socks. The exception to the socks matching the pants rule is when you're making a fashion statement with your socks. Former President George H.W. 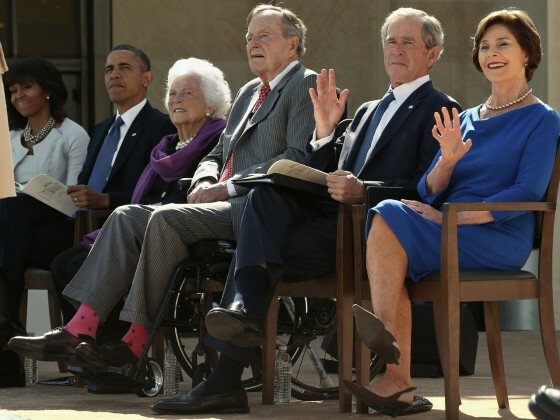 Bush has been famous recently for wearing brightly colored socks with his suits. Doing this is a fun way to add a splash of color and individuality to your outfit. Just remember NOT to make a fashion statement with white athletic socks. Belts: If you are wearing a suit, or any type of dress slack, you should be wearing a belt ... even if you don’t need it. Your belt should match your shoe color.So, if you’re wearing a black belt, do not wear brown shoes. Many of your competitors do not look the part of the successful business person, giving you a huge advantage of winning your customer’s over, if you look the part!